Each element was recorded with 3 microphones positions and we added some synth samples, you can adjust the pan, volume or mute of each one independantly. You also have access to a set of presets. 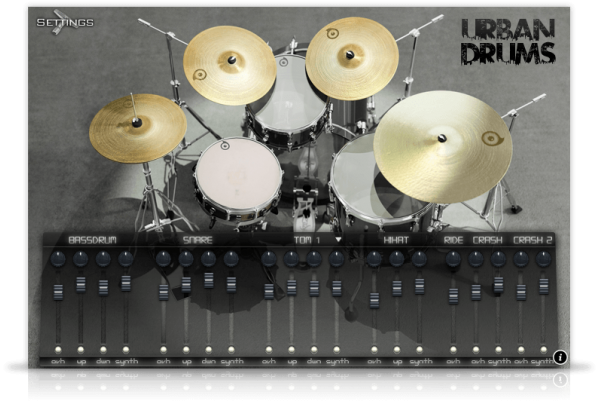 Urban Drums comes with its own sample player, the UVI Workstation 3 (requires v3.0.0 or later). 1.83Gb uncompressed, 816Mb compressed in lossless flac format, around 2014 samples. 3 microphone positions plus synthesized samples for each drum that you can mix and/or disable from the interface. up to 20 velocity layers per element. 4 round robins for each element. Detailed snares, 4 different hit positions for the snare plus auto roll script.